Thick clouds emanate from a coal-burning power plant in Baishan, in the Jilin province of China. 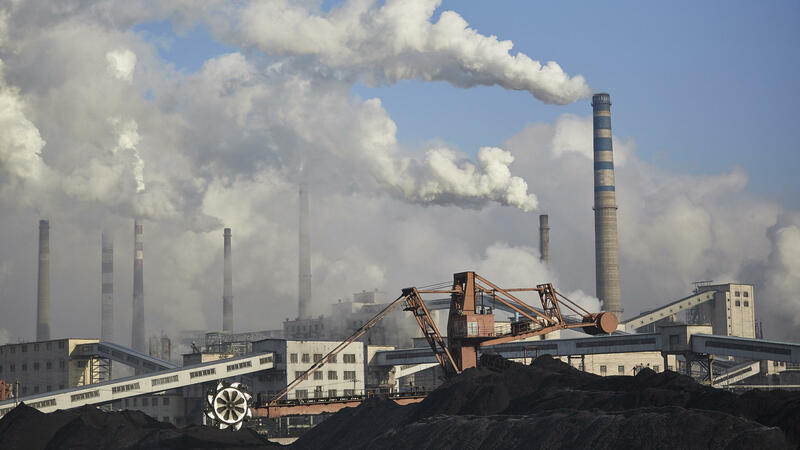 In an effort to boost its economy, China has recently started greenlighting coal projects that had been on hold. The CO2 increase in 2017 over the previous year was 1.6 percent, and in 2018 it's looking like emissions will have grown a further 2.7 percent. With the economy strong throughout most of the world, 2019 looks to be headed in the same direction, in terms of carbon emissions. The recent slowdown in emissions and the subsequent uptick are both largely the result of what's been happening in China. "Their economy has been slowing a bit," says Jackson, which is one reason global emissions stalled (China is the largest emitter of CO2 in the world). But now, says Jackson, "the government is trying to boost growth, and they're green-lighting some coal projects that had been on hold." India is also using a lot more coal as the government tries to bring electricity to millions of residents who don't have it. The country's emissions of CO2 have increased, on average, by 4.7 percent a year since 2000. Writing in the journal Environmental Research Letters, Jackson notes that Americans are using way less coal now than they used to. But like most other people in the world, they're using a lot more of another kind of fossil fuel: petroleum. "It's cheap gasoline," says Jackson. "We're buying bigger cars and we're driving more miles per vehicle." Jackson also notes that emissions from air travel recently have been growing about five percent a year. Another hurdle, reported in the journal Nature this week, is that China is cleaning up its air pollution. That sounds great for pollution-weary Chinese citizens. But climatologists point out that some of that air pollution had actually been cooling the atmosphere, by blocking out solar radiation. Ironically, less air pollution from China could mean more warming for the Earth. Still, some climate experts meeting in Poland have been eager to point to successes rather than a looming carbon apocalypse. For example, take a look at clean energy growth – particularly solar and wind power, says Corinne Le Quéré, from the University of East Anglia, in Great Britain. "There has been investment by governments and by businesses in wind and solar energy, and these investments have driven down the costs," she says. In some places, the cost of building new solar plants or wind generators is competitive with new coal plants. Still, even as solar and wind power grow, these forms of energy are often meeting additional demand for electricity in growing economies, rather than putting old coal-fired plants out of business. So they're not necessarily reducing CO2 emissions. Le Quéré acknowledges that renewable energy is far from replacing fossil fuels. And negotiators in Poland just got a rude reminder this week of how hard it can be to get people to kick the fossil-fuel habit without a ready alternative: In France, a proposed tax on diesel fuel and gasoline that was aimed at cutting consumption has caused widespread rioting over the past several days. The French government quickly put that tax idea on ice. The problem there, Le Quéré says, was that the French government didn't do a good job of preparing its citizens. "In order to implement climate action," she says, "one has to think about how it's going to feel like from the customers' perspective — people who need to transport themselves, to go to work. What are the alternative options that are available for them? Everybody needs some warning about what is going to happen." In Poland, climate negotiators from around the world are meeting to figure out how to keep greenhouse gases out of the atmosphere. The task looks harder than ever. As NPR's Christopher Joyce reports, new research shows emissions are getting worse. CHRISTOPHER JOYCE, BYLINE: For three years, the news about global emissions of the biggest greenhouse gas, carbon dioxide, was pretty good. They were leveling off. But then they started to rise again in 2017, and they're still going up. Rob Jackson is a climate researcher at Stanford University. ROB JACKSON: Last year, we thought it was a blip or could be a blip, but it isn't. This year, we're up again, the second year in a row. And emissions are rising. JOYCE: The slowdown and then the uptick are largely the result of what's been happening in China. JACKSON: Their economy has been slowing a bit. JACKSON: The government is trying to boost growth. And they're green-lighting some coal projects that had been on hold. JOYCE: India is also using a lot more coal as the government tries to bring electricity to millions who don't have it. Writing in the journal Environmental Research Letters, Jackson notes that Americans are using way less coal now. But like most everyone else in the world, they're using a lot more of another kind of fossil fuel. JACKSON: It's cheap gasoline. We're buying bigger cars, and we're driving more miles per vehicle. JOYCE: Another hurdle reported in the journal Nature this week - China is cleaning up its air pollution. That sounds great for pollution-weary Chinese citizens. But some of that air pollution actually cools the atmosphere. It blocks out solar radiation. Less pollution ironically could mean more warming. Some climate experts meeting in Poland are eager to point to successes rather than a looming carbon apocalypse, like Corinne La Quere from the University of East Anglia in Great Britain. She says take a look at clean energy growth. CORINNE LA QUERE: Particularly solar and wind power. There has been investment by governments and by businesses in wind and solar energy, and these investments have driven down the cost. JOYCE: Down to where renewable energy can compete with coal for new power plants. But renewable energy is far from replacing fossil fuels, and negotiators in Poland just got a rude reminder of how hard that will be. In France, a proposed tax on gasoline meant to cut consumption caused widespread rioting. The French government quickly put that idea on ice. Christopher Joyce, NPR News. (SOUNDBITE OF HOT SUGAR'S "PLASMA") Transcript provided by NPR, Copyright NPR.